About a month ago, there was a message on my neighbourhood's Facebook group that local artist and clothing designer Nadia Llyod was looking for "Everyday Women" to be models and spokespeople for her line of clothing. On a whim, I decided to apply and I got an email a couple of weeks later saying they had a lot of applicants and would get back to the chosen spokespersons in a couple of weeks. I really didn't think I had much of a chance, but then in early May I got an email saying I had been chosen!! The modeling session was a couple of weeks ago and I was super nervous as I had never modeled before and I can be super awkward in front of the camera. But I met Nadia and her team and they were all so amazing and kind! I actually ended up modeling with her line of pillows, and then a couple of scarves and a clutch. It was a really fun day and I am super excited to see the photos when they come out! As a thank you for helping with her campaign, I got to chose one of her pillows to take home with me! The Horizon II was calling my name from the moment I saw it, so I picked that one! 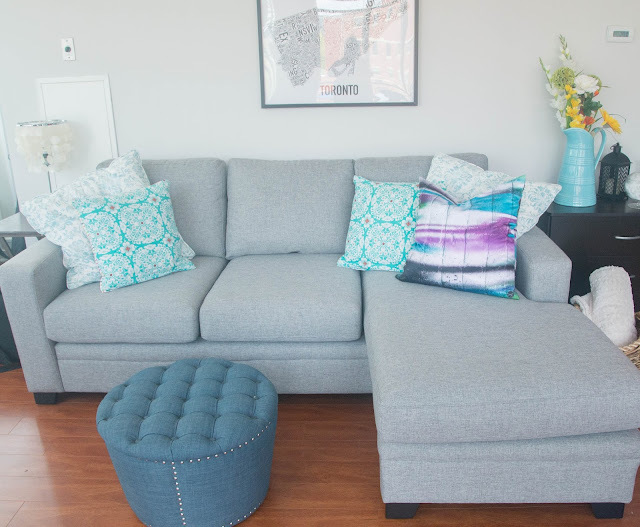 The pillow has a really silky feel to it and is so nice and cushiony that it is quickly becoming the coveted pillow for couch lounging. I also really like Nadia's art and the other pieces in the collection so I encourage you to check out her site. She focuses a lot on Toronto and graffiti art so it is a really funky and urban look ranging from paintings to clothing. I saw a bunch of her leggings and skirts on the other models and they were amazingly cool! 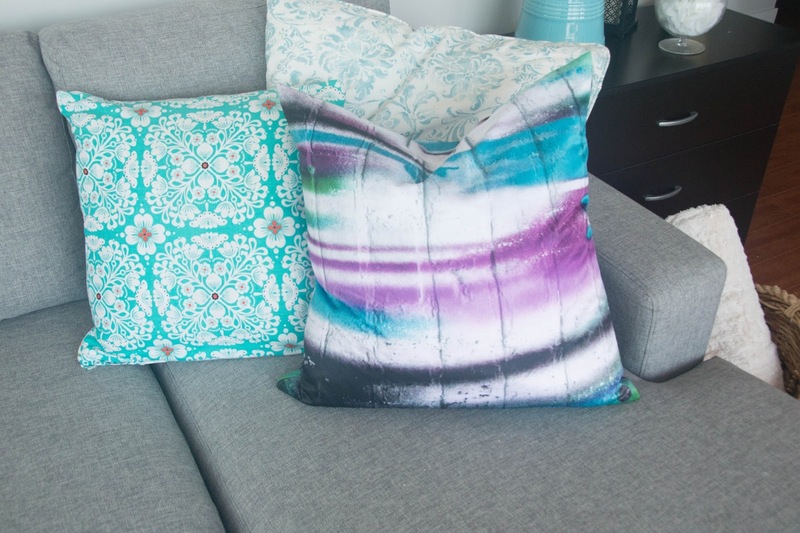 I love the colours in the pillow and I will definitely be basing my fabric and art choices for the living room against it. I have always loved turquoise, and had been considering purple as an accent colour for this living room as well, but now I feel I will need to tie a bit green in too! Nadia is also the creator of the Toronto Art Crawl, presented by Varekai, Cirque Du Soleil this summer. There are a few different dates for their outdoor art fairs and I am hoping to make it out to one of them (the first one is in June, but I am out of town). 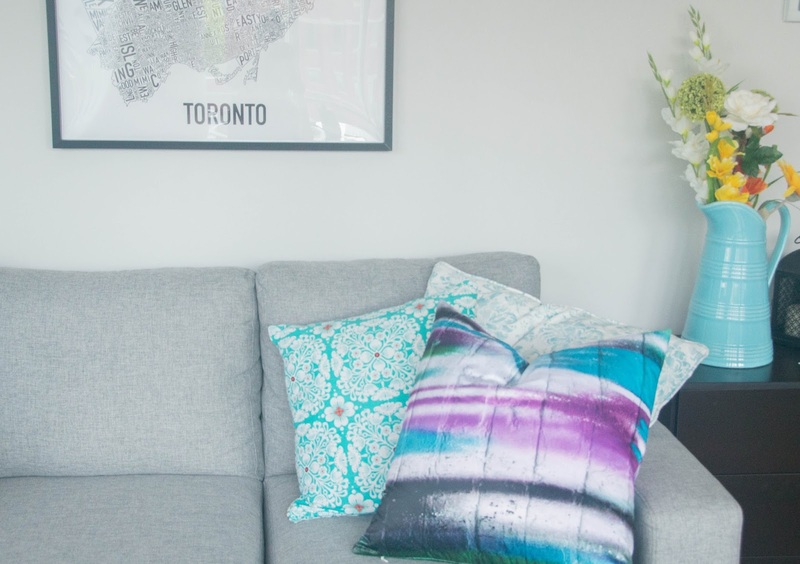 I love supporting local artists and bringing a taste of Toronto into my home decor. I love this city!! And, of course, once I see my photos from the campaign I will definitely share them with you guys! Should be some time this summer.